If you’re buying or selling a home you need an honest inspection of that home. We have been working with local Real Estate Agents for over 21 years. We can help you get the job done at a price that won’t break the bank. Onsite estimates and consultations are free in most cases, we also provide termite inspection reports for real estate transactions, escrow or refinances for a nominal fee. Because we offer whole house fumigations and local treatments, we can design a personalized program for your unique situation. Whether you need a one-time service or would like the convenience of regularly scheduled visits, you can count on us to design a personalized program for your individual needs. Not every house needs to be fumigated but only whole house Vikane fumigation kills Drywood Termites in inaccessible areas. We will perform a thorough inspection and recommend a treatment plan based on your unique situation. Are you hearing scratching sounds or strange noises in your attic or walls? Chances are, you’ve got an unwanted house guest. Rats are very destructive pests that can spread disease, contaminate food and cause costly structural damage. Our four-step process of Inspection, Control, Exclusion and Clean-up and help you solve your rodent problem at a price that won’t break the bank. Rest assured, if your home does have damage, our staff of carpenters has the experience to complete the repairs saving you time and money to hire contractors and other tradespeople. If you have Drywood Termites, you have several treatment options available to control them. These include heat, cold, electric shock, chemical, microwave and whole house fumigations. We will professionally inspect your home and let you determine what method is right for you. Subterranean Termites live in the ground. We use Termidor, the world’s number #1 pest defense against these termites. We will be happy to show you the benefits of this superior product. Fungus and Dryrot are usually caused by an excessive moisture condition usually resulting from a plumbing leak or leaking roof. We will find and fix the source of the moisture and then replace any damaged or infected wood. Tiger Termite offers yearly service plans with termite insurance to protect your home against future attacks. There are a variety of safe and effective ways to prevent termites, rodents and other insects from entering your home. Schedule a free estimate and one of our licensed inspectors will customize a plan just for you. We are specialists in the treatment of wood-destroying pests and organisms. We offer treatment options to fit your needs and circumstances. All areas treated are guaranteed. When you have a termite or pest problem, you want to get the problem fixed right the first time. 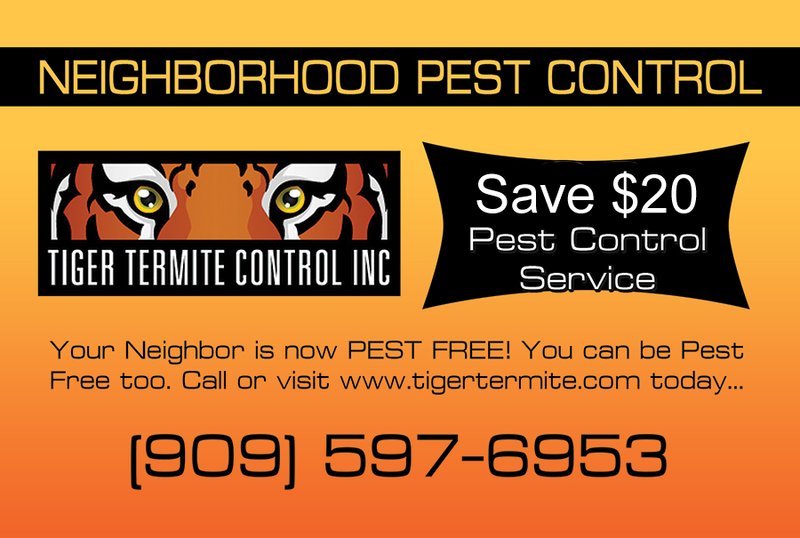 For quality termite or pest control and fast results, call us today at (909) 597-6953 and get a free estimate!